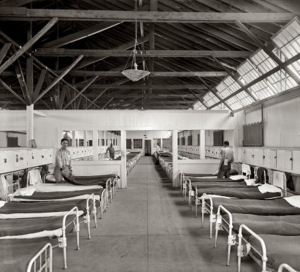 The District of Columbia Workhouse and Reformatory were established in the early 20th century in response to a call from President Theodore Roosevelt to create a new kind of correctional facility, a “prison without walls,” that would be a model of reform. 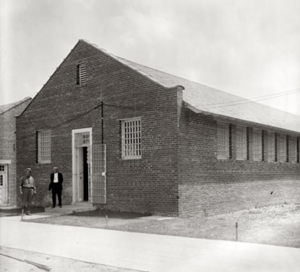 Conceived during the Progressive Era, the facility’s mission was to reform offenders by putting them to work on the prison farm or teaching prisoners with longer sentences a trade that would enable them to become and remain productive members of society. Built in a countryside setting, the design of the buildings and the campus itself was intended to inspire the prisoners and to be an integral part of the rehabilitation process. 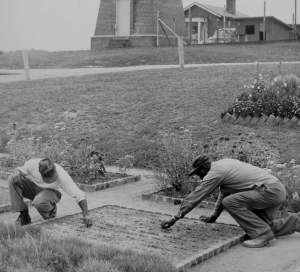 The Workhouse and Reformatory were planned to be as self-sufficient as possible, using prison laborers to make the bricks at on-site kilns, build and maintain the structures, produce food on the working farm, and provide a variety of other trades, including plumbing, electrical, and auto repair. The design of the buildings and the layout of the campus deliberately embodied the ideals of Progressive Era reform by removing barriers, encouraging constructive social interaction, and promoting work ethic through vocational training. To support these ideals, the Reformatory was designed around a central quadrangle, reminiscent of a college campus. A series of “dormitories” were arrayed around the quadrangle along with various other facilities, including an administration building, gymnasium, medical building and dining hall. The site plan and buildings were designed by notable Washington D.C. architects Snowden Ashford and Albert Harris. The style of the buildings is predominantly Colonial Revival, popular in the early 20th century and frequently used to engender and recall the values of the nation’s Founding Fathers. Today, the Workhouse is home to the Workhouse Arts Center, located at 9601 Ox Road, and the Reformatory is home to the vibrant, mixed-use community Liberty. Get the full story on the acquisition, history, and planning. Images via shorpy.com and fairfaxcounty.gov.